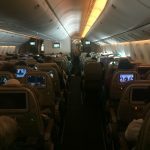 ✅ Trip Verified | I had a very uncomfortable journey on Etihad Airways A380. I found the seats to be really hard and the legroom was not spacious as that of other major airlines. The seat table was not cleaned well and was sticky. ✅ Trip Verified | I paid the extra for the emergency exit. The whole experience from UK to Thailand and back was poor. The seats seem to be the narrowest I have encountered and very uncomfortable. When leaving the aircraft through the business class cabin I noted the same there. I had considered upgrading to business but I am very glad I didn't. The food was of poor quality and my partner had ordered a gluten free meal which never arrived on one of the legs, given away to another passenger. The meals that did arrive as ordered, one had an apple and apple slices on the same tray. Half cups of tea without refills and no alcohol offered from Abu Dhabi to Manchester. The entertainment did not cater for the UK market, nearly US programs and music selection poor. Voting with my feet not traveling Etihad again! "will not fly with them again"
✅ Trip Verified | Paid more to fly what I thought was a premium carrier, with better flight times/connections. 1st mistake. LHR-AUH-BNE & return. 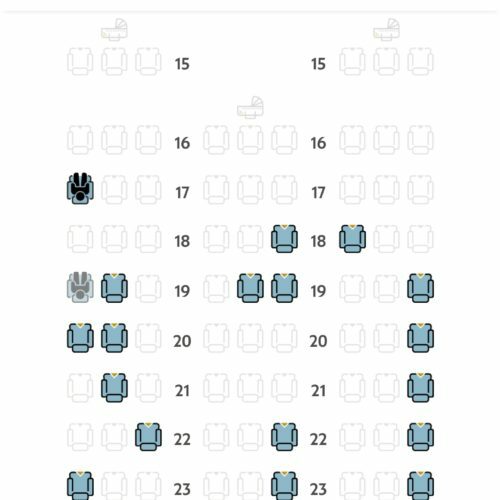 Checked in online & allocated seats at opposite end of aircraft for all 4 flights to my wife. Called Contact Centre & given the runaround from a very rude & abrupt operative who said it was my fault for not paying extra to guarantee a seat! All flights were punctual & on the face of it not too bad. However IFE on all flights came on half an hour after take off & was shutoff 45 mins before landing. 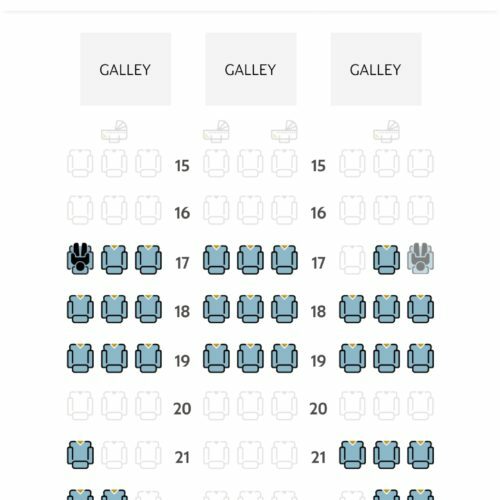 This is ridiculous & I've never seen on any other airline. Seats were very uncomfortable & I was continually squirming around trying to get comfortable, Boeing 787 seats were much harder than the A380. Food was pretty poor all round & a breakfast was inedible. Drink service was non-existant. BNE-AUH was just short of 15hrs. We got a meal & drink an hour after take off - next time the crew were seen was 10hrs into the flight. Really? What sort of service is this? To add insult to injury one suitcase came round the carousel at LHR damaged with half the contents missing. Really disappointed & will not fly with them again. ✅ Trip Verified | Hands down one of the worst airlines I've travelled with. We booked with Etihad because we made the assumption they were a premium airline with a high service level therefore worth the price. We were wrong. Budget airline service at premium prices. The outward leg of this journey from London-Singapore via Abu Dhabi was vastly worse than the return. The seats are very cramped. My seat was broken on both legs meaning I could not recline and when the person in front did, I was left with 6 inches between my face and their seat back. Both myself and my partner left both flights incredibly dehydrated - we had to ask multiple times for water (it is NOT acceptable to serve liquids only twice in 7 hours, especially not when you insist on filling the thimble sized cups only halfway). After asking a second time for liquids, the cabin crew ignored and subsequently turned off my partners request button before getting annoyed when he went to the galley to ask. To say the food was revolting is an understatement. No menus are provided on board and the staff do not describe the meal past "chicken, lamb or vegetarian". Dinner consisted of a rock hard bread roll, a bone dry cous cous 'salad' (not that there were any vegetables in it) and in my case some dry pasta with a small amount of tomato sauce and a dry cake - apparently vegetables are not part of the Etihad service. What a come down after having experienced food on Emirates or Malaysian Airlines! The snack comprised a hot pastry before we disembarked. Food on the second flight was no better - bland cold noodle salad then "Spicy chicken noodles" which was actually more slimy than spicy and a snack comprising a rock hard bread roll with a smear of mystery filling. The second leg from Abu Dhabi to Singapore was a source of greater annoyance as it was announced that we would be delayed AFTER they had boarded us, probably by an hour or something (90 minutes eventually sat without water). We had onward transport arranged and were trying to figure out if we would still make it. Questioning the passengers around us it turned out that our tickets all had different scheduled arrival times on them and the crew had no idea what our original landing time should have been. If you want extra snacks between meals then good luck - in line with budget carriers you have to pay extra for this! Given how much the flight tickets are, this has to be a joke. One wonders if this is why the food is so poor - to encourage people to buy extras. The entertainment system is another source of annoyance - endless advertisements and announcements which interrupt it for 5 minutes at a time. Screen pop ups advertising snacks or duty free are also extremely irritating. The system does not start up until you've been in the air for 30-40 minutes and then shuts down 40 mins to an hour before you land, mostly without warning. 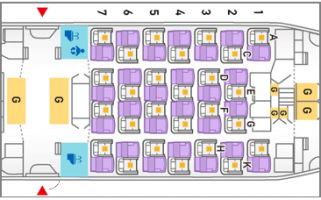 Charging for seats up until 24 hours before the flight departs also seems tight - some of the seats cost £60 to reserve. That's obscene. I discovered on the return leg (Singapore - Abu Dhabi - London) that delayed departures are so common for Etihad that their scheduled flight and arrival times are essentially meaningless, having spent another hour sitting on the tarmac at Abu Dhabi for no apparent reason. This was our first time travelling with Etihad and it will certainly be our last. Appalling, careless service at inflated prices. Emirates, Singapore and Malaysian Airlines are no more expensive and vastly superior. ✅ Trip Verified | Seat pad extremely uncomfortable - put blanket on top, and cushion for some of the flight but very hard to get comfortable. 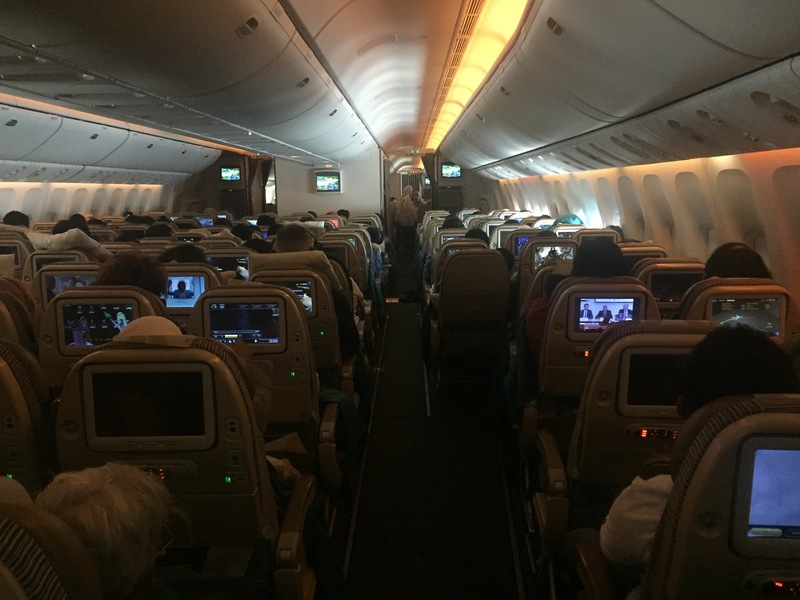 Travelled on A380, Boeing 777 and A330 during the return trip and all were the same. Headrest and recline was good, but pad was so bad that the rest of the seat was irrelevant! "Seats are way too narrow"
❌ Not Verified | Seats are way too narrow, poor leg room and very uncomfortable. Next to this the aisle is to small for the trolleys which are constantly bumping against your shoulder when moving past just like every passenger or cabin crew member when sitting on the aisle seat. Also an outdated TV touch screen, reaction time is very slow and when the seat in front reclines very hard to see the screen. "never travel Etihad Airways again"
✅ Trip Verified | Booked my ticket via Virgin Australia but was on their shared airline Etihad Airways. 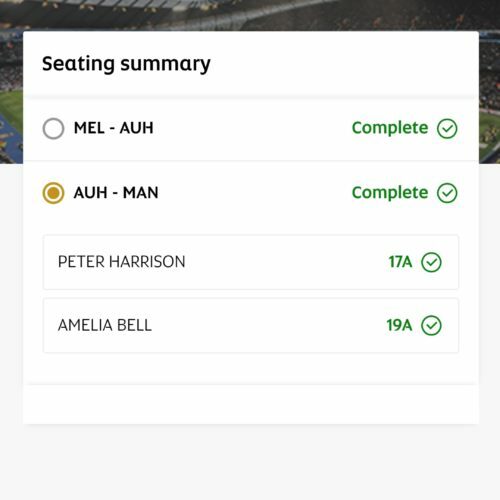 Couldn’t pre book my seat until I arrived at the airport where being a tall man and arrived before checkin opened I requested a window or aisle seat to be able to extend my legs a bit as I was travelling from Auckland to Brisbane to Abu Dhabi onto Manchester. The first flight was fine as I was able to pre book that seat on online checkin. The next 2 flights had to be allocated at the counter and this lady had no intention for my request. After she printed the seats for all flights she said oh I’m sorry you wanted a window or aisle? I got middle all the way and she then said I can’t change now but to get it sorted in Brisbane. Well we all know when you are on transfer that you can’t see anyone to change the seats. Flights were full on them all so was pretty uncomfortable for 30 hours. The planes were 787-9 and my knees were rubbing the seat in front so after 30 hours I was quite sore and tired. I travelled home from Manchester yesterday with Singapore airlines and the legroom was great with about 3 inches gap from knees to seat in front. Food and service were great except for legroom. Will never travel Etihad Airways again. "do not provide a decent legroom"
✅ Trip Verified | Seating on Etihad Airways A380 aircraft is designed for comfort however the seats do not provide a decent legroom as many similar type of aircraft. I was lucky to have ample leg room since I was on a bulk seat right next to the aircraft gate. As soon as I boarded realized that the screen was not working hence I traveled on a 14 hours flight pretty much without any IFE system. 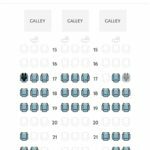 ✅ Trip Verified | Seat space good for normal person but small for tall persons. In flight meals should have been served in accordance with landing area local time, and not 1 hour after take off. In flight trays and meals are a little small - as passengers have only one tray for 7 hours flight time. In flight entertainment with a lot of films but should be turned on from embarkation to disembarkation.